The trickle of bright white wires – first over black silhouettes in adverts, then from the ears of people passing you on the street, and finally from your friends and family – was the sign the iPod takeover was in full swing. While the white earphones were a big part of the iPod's distinctive design and brand, like most bundled earphones, they weren't actually much good for audio, so many devoted iPod fans ditched them for alternatives (better sound wasn’t the only reason to get rid of the white originals, either). When Steve Jobs introduced the iPhone, he praised it as ‘the best iPod ever’, and he was right: the iPhone’s ability to play music while browsing the web and dealing with email has been rightly praised. When a call comes through, the music you’re listening to fades gracefully away. Even better, Apple improved the bundled white headphones by adding a microphone and clicker-switch with decent remote control functions (as well as improving the material of the cord). Sadly, since the sound quality still leaves a lot to be desired, replacements are still in order – but ideally, ones that feature the clicker remote and microphone. 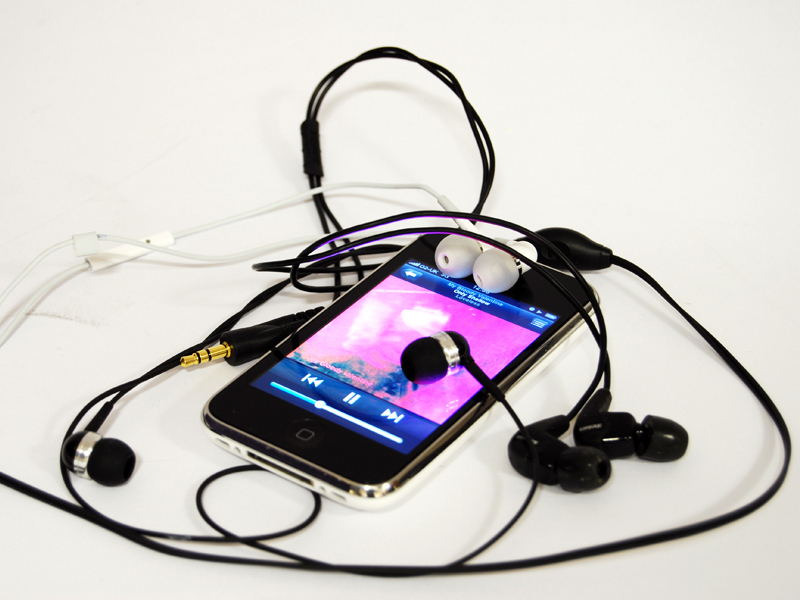 We’ve rounded up five sets of iPhone earphones and put them on test to see which makes for the best replacement. The iPhone uses earphones with a standard 3.5mm stereo jack, so all the products reviewed here will work with any phone, media player or device with that connection – however, as we’ve specifically looked for iPhone-compatible earphones with microphones, cheaper earphone-only sets might be available. In addition, we’ve also tested the earphones with an iPhone listening experience specifically in mind. This means we stuck to playing back compressed audio files and we didn’t listen in complete silence either, trying all the earphones in a range of environments, from a relatively quiet office to the full-on noise of a walk down Oxford Street in central London. As is unfortunately traditional with earphone reviews, I’ll begin by talking about the music used for testing to surreptitiously show how great my taste is. The songs were all either MP3s encoded at 128, 256 and 320kbps, or 256kbps AAC audio files bought from iTunes. We picked songs encompassing a range of different styles – pop, rock, rap and instrumental pieces such as soundtracks. Tracks we listened to included Battles robotic, insistent software-rock song ‘Atlas', Beyonce’s staggeringly irritating (yet ingratiating and addictive) Single Ladies and the Kanye West produced Jay-Z track, 'Heart of the City'. To those we added The Replacements’ Alex Chilton, easily the best song in Rock Band 2, a rocking piece of power pop that really rewards drive, dynamism and punch and My Bloody Valentine’s wall-of-noise classic 'Only Shallow'. Fleet Foxes White Winter Hymnal is a lovely acoustic track that foregrounds vocal harmonies. We also used Black Leyh’s ‘The Fall’ better known as the sombre, sinister instrumental exit music from The Wire and a selection of movie soundtracks. As well as just general listening to the tracks, we also set each set of headphones a specific test – the ‘Hey Jude’ challenge. This involves listening to The Beatles’ Hey Jude, and seeing how easy it is to hear when John Lennon drops the F-bomb – a tiny mistake that’s barely audible about 2:58 into the track, and which is a serious challenge for headphones to reveal. We also tested how well the earphones handled voice material, both by listening to podcasts, and making phone-calls, and how easy the remote control was to use. We also assessed how comfortable the earphones were to wear, build quality, extras, and of course, price. Cisco announces that the Flip range of camcorders is to be canned.